1832 - Elizabeth Dodds was born to George Dodds –wine merchant and Margaret Dods nee Smith in Edinburgh December 17th 1832. 1850 - Elizabeth Dodds of Tron Church Parish married John Aitken (Jr.) on October 13th 1850 in Edinburgh. At the time of marriage he was a painter, residing at 104 High Street, Tron Church Parish. She died in 1884. John Aitken was son of John Aitken and Margaret Aitken nee Wishart *Tron Kirk – is just of the High Street (the Royal Mile). 1855 – John Aitken (Sr.) aged 48 years* old dies. He is listed as Temperance Hotel Keeper– son of John Aitken, Tailor and Henrietta Aitken (nee Fraser). 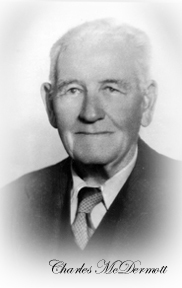 1859/60 – Charles Joseph McDermott born to Charles Joseph McDermott –landed Proprietor and Lucy McDermott nee Rowland. 1863 – Margaret Wishart Aitken was born on July 21st 1863 at 108 Argyle Street Glasgow to John Aitken – Temperance Hotel Keeper and Elizabeth nee Dodds She died in London in 1942.